Six Acrobats slot review: 25 free spins bonus - win 390,000 big jackpot! Play the new Microgaming slot, Six Acrobats and exercise your flexibility on a world stage of professional acrobats. This slot has 5×3 reels, 9 fixed paylines, multipliers, Free Spins, Wild and Scatter symbols, and offers a colourful insight into the Chinese acrobatic world. 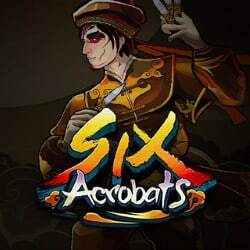 Six Acrobats features a band of travelling acrobats who are enthusiastic to show off their skills through magnificent animation and thrilling features. This amazing game is available on Desktop and Mobile, meaning that you will not miss any opportunities to play when you’re feeling lucky. When you land Wild symbols in any position, they will substitute all of the symbols except the Scatter symbol. That’s not all, when you complete a win with a Wild symbol during the base game, your wins will be multiplied by 5x. When a Wild symbol completes a win during the Free Spins feature, the win will be multiplied by an unbelievable 25x. Scatter symbol wins will multiply by the initial bet. Scatters pay in any position and they will add to the payline wins. Play to change your fortune forever at any of the Microgaming casinos and stand a chance to win the amazing 390,000 coin jackpot.